Playing cards and music go hand in hand - both require in-depth thought, precise practice and a great deal of patience and stoicism. So it's only right that these Playing Cards are perfect for any musician. Playing cards and music go hand in hand - both require in-depth thought, precise practice and a great deal of patience and stoicism. So it's only right that these Playing Cards are perfect for any musician. 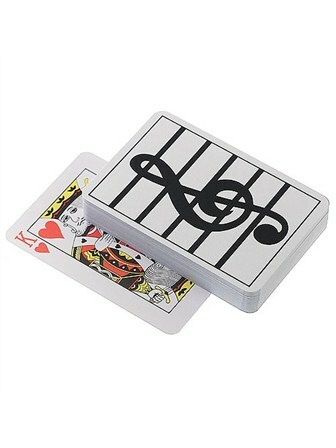 With a Treble Clef design on the back, these cards are made of high-quality plastic and will always remind you of music, like when you hear the rhythmic beat of shuffling, or your friend emits a falsetto scream as you win the hand! So whether your favourite song is the 'Ace of Spades' by Motorhead, 'Queen of Hearts' by Juice Newton or 'The Joker' by the Steve Miller Band, you will love these cool music-themed Playing Cards.